There probably isn't much reduction in the trans because there's already a 2:1 reduction in the portals. In my Gen7, those portals made the truck ridiculously slow because of all the reduction. The axle housing is actually multiple pieces. I have a set from testing, and the c-hubs are indeed a separate piece on each end. There's some good photos of the portals with the metal upgrade parts on them in the Gen8 facebook group. The engineers/designers have them on their test rigs & have been showing up at local crawls in AZ. According to Redcat, the upgrade parts will be in stock when the trucks are released for sale. 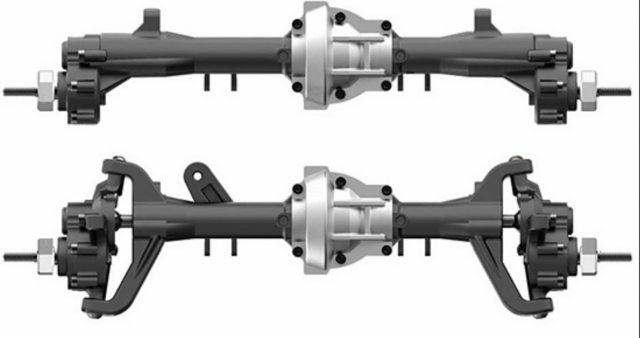 Can anyone give me a hex to hex measurement of these axles. I might be interested in a set of these for another project I'm working on. If I remember correctly, when I measured them they were 195mm. Thank you! Seems like they're a little wider than I thought.